The Nossenhaus is the second oldest building in Andermatt, Switzerland, dating back to 1620. 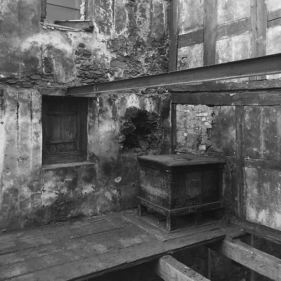 Having fallen into disrepair, our practice in collaboration with Ruedi Kreienbühl, were commissioned to transform this ruin, which was originally occupied by several families across four small apartments, livestock on the ground floor and food stores in the roof. Preserving the sense of shared spaces, the Nossenhaus is now a multifamily dwelling on the upper levels and a bar below, with new materials selected to fade into the older elements over time and create a canvas for future collaborations.